Lightweight Vacuum Cleaners – Vax Air Cordless Lift U85-ACLG-B – prepare for lift off! The ‘Lift’ was only launched recently (available to purchase early 2015) and has been an eye opener for a number of customers. The feature which stands out the most, compared to all upright vacuum cleaners, is the ability to lift off the main compartment in order to clean your stairs or vehicle. Many upright vacuum cleaner enthusiasts find it extremely difficult to clean these two key areas, as the hose is never really positioned to be flexible enough to clean objects in difficult places. The Vax Air Cordless Lift (also known as the U85-ACLG-B model) has really changed the way we clean and has made the process far easier. This machine is also cordless, which means no fiddling around with plugs and tripping over cables (perhaps the ideal solution for the elderly or disabled?). Vax have designed their models so steering around furniture and other objects has become extremely easy and doesn’t require much effort. That said, the ‘Lift’ is slightly heavier than most uprights (around 5.1kg in total weight). However, disconnect the main compartment and you’ll only be carrying around just over 3kg! A much better option that carrying the whole weight of your machines up and down stairs. Of course, with every cordless cleaner, you are faced with a small window of run time before the batteries have to be charged. Vax have got around this by providing two lithium batteries, giving you approximately 50 minutes of use, batteries combined. The only downside to this is that you won’t know when the battery life is coming to and end. It’ll suddenly stop working and you’ll need to charge it for a few hours or replace with the other battery (which hopefully you’ve charged). It’s pretty simple to keep the batteries charged for your next use and they don’t deplete like other normal batteries. Assembly of the unit is easy to follow, using the manual. Once the battery is charged and in position, you can start cleaning with the various accessories. Cordless, so no need for cables and having to find plugs around the home. Main compartment ‘lifts’ off, so you can clean difficult areas without having to carry the whole unit. 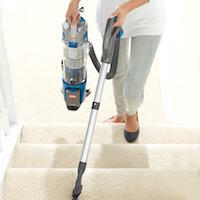 The weight dramatically decreases and will benefit those who struggle with their vacuum cleaning. Two lithium batteries, so one can always be kept charged ready for the next use. Numerous accessories for difficult to reach areas. Can clean vehicles with no fuss and no trailing cables. When depleted, the batteries will suddenly stop working, so you won’t be able to use the machine if you’ve forgotten to charge the batteries. The price tag is a little high, but typical for cordless machines using lithium batteries.